KNOW the feeling? That old diluted feeling? Those shares that once held such promise now languish at a fraction of a cent. They’re worth even less than the amount of tax Google Australia pays in Australia. That’s low. What do you do? Why sell them when they’re worth less than the brokerage? Why not slip them in the bottom drawer? One day, suddenly, there is a glimmer of hope. A letter arrives. Your exploration company has been transformed. Like the butterfly rising resplendently from the ashes, your company is on the cusp of finding a cure for cancer. Alas, there has been a restructuring. The shares which were worth a fraction of a cent are now fetching a fraction of a fraction of a cent. Even if they did achieve that cure for cancer, after just one more equity raising, your share would not even be enough to chip in with your mates – who, by the way, are definitely not mates with any good old Labor ministers – to buy that stretch of dirt that is just about to become a coalmine in New South Wales. Shareholders in Compass Resources know that feeling. One day they owned a billion-dollar enterprise touting the fourth-largest lead project in the world. The next, they found themselves diluted to 5 per cent of the stock. Even more galling was the fact that their chairman, Gordon Toll, and a US hedge fund emerged with the other 90 per cent or so – a good old debt-for-equity swap, you see. Gordon and the hedge fund, Yorkville Advisors, had helpfully provided some loans to Compass before its grisly demise. Those loans would become equity thanks to a deal with Ferrier Hodgson, appointed administrators in January 2009. Now, Yorkville and its founder, Mark Angelo, have been charged with fraud by the US Securities and Exchanges Commission. Unwired, Industrea, Murchison Metals, Queensland Gas Company and Fortescue Metals. So shareholders in the above might care to check the status of their credit arrangements with Yorkville, or YA Global as it is known. YA practices a pernicious form of lending called ”death spiral financing”, where it is issued with shares in the company with which it has struck its funding deal – usually a company desperate for cash. YA can therefore ”short” the stock in the knowledge that it won’t have to buy back the shares on-market to cover its position. 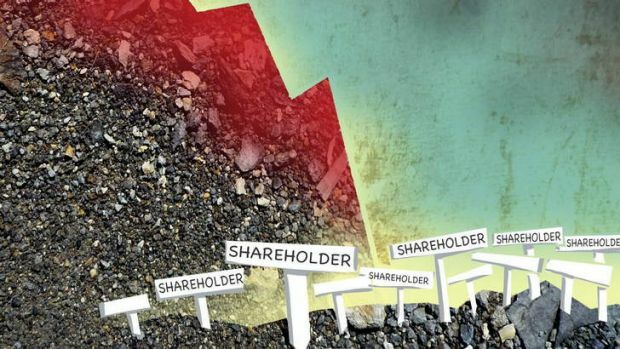 Shareholders in Compass Resources, who are still clamouring for justice, could be forgiven for suspecting that YA cleaned up by shorting shares in their company before it became a secured creditor and emerged from administration with the bulk of the stock. A neologism is in order. We hereby coin the word: shareholdercide. THERE was a kerfuffle this week when the regulators sprung forth with a critique of audit firms for being increasingly useless. “We can’t sit by and see a further deterioration – we’re talking about the cornerstone of commerce, to rely on financial statements that are not misstated,” was the utterance from the chairman of the Australian Securities and Investments Commission. At this, some must have wondered if the regulator should first extract the native rainforest from its own eye before worrying about the mere log in the auditors’. Two points here: one, ASIC’s claims that auditors provide poor value for money are completely with merit. Never a truer word spoken. Two, we draw the regulator’s attention to its own database. It is here that a company search for none other than ASIC Test Company Pty Ltd will throw up an entity with no extant homo sapiens as directors; that is beside the litany of other disclosure transgressions. One is the ASIC Test Co’s financial report for 2009, which actually belongs to Tourism & Asset Holdings, a property plaything whose directors included David Baffsky and Phillip Hartley Green – yes, that Phil Green, the one making the world’s most secretive corporate comeback. Wrong ACN number you see. And yes, this search for public information which the public has already paid for via their taxes costs $18 to $30 or so a page, no matter how useless the information. If this is the ”cornerstone of commerce”, commerce is in trouble. We have witnessed myriad large companies and multinationals not even being fined the cost of an ASIC document search for lodging late or not even lodging. Then there’s Compass, a company which boasts the distinction of being the first in the world to have issued a 42-day half-yearly report. The old-fashioned among us might view a half-year as amounting to six months in duration. Not Compass. Instead of an annual report, they produced an 11.5 per cent of the year report and called it a half-year report. They failed to hold an AGM last year. Perhaps they had an exemption. Even if they did, apparently this would constitute public information that is not available to the public.